Painted for Hedgehog Week with Suffolk Wildlife Trust, on the Swan pub in King Street, Ipswich. Hedgehogs are disappearing very fast, down from 60 million in the 1950s to less than 1 million today. It would be a tragedy if they disappeared completely; they have been around for 30 million years. 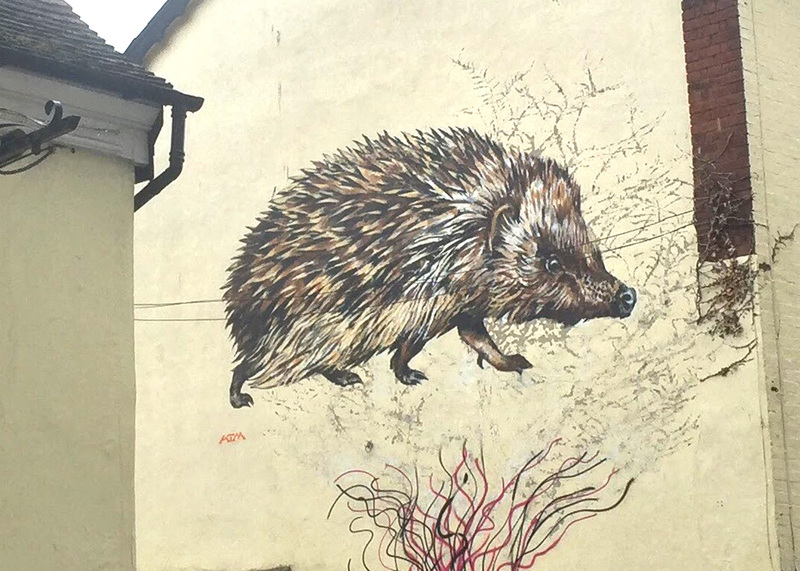 This is part of a campaign to make Ipswich the most hedgehog-friendly town in the UK. • Provide log piles, rotting leaves, nectar-rich flowers, to encourage all the insects and slugs hedgehogs eat. • Make hedgehog-sized gaps- 13cm- in garden fences to allow them to travel from garden to garden. They travel up to 2-3 km a night. • Be less tidy- let autumn leaves rot where they fall or leave them in piles. Let parts of our gardens remain overgrown. • Don’t use slug pellets or pesticides, they poison hedgehogs too. • We can feed hedgehogs, they like tinned dog food mixed with dog biscuits! They also appreciate a dish of water. • Never feed bread and milk to hedgehogs, it makes them ill.